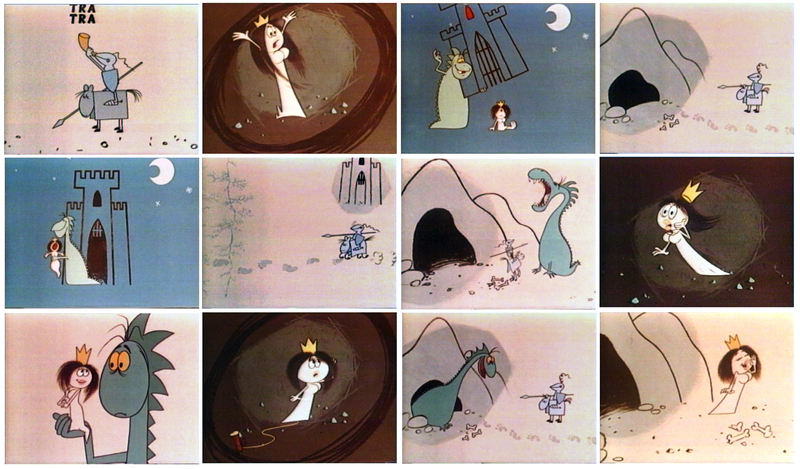 the screen captured scenes above are from a short 7 VERSIONS OF A FAIRY TALE the hungarian animator and director ATTILA DARGAY ( 1927 – 2009 ) created in the eighties. 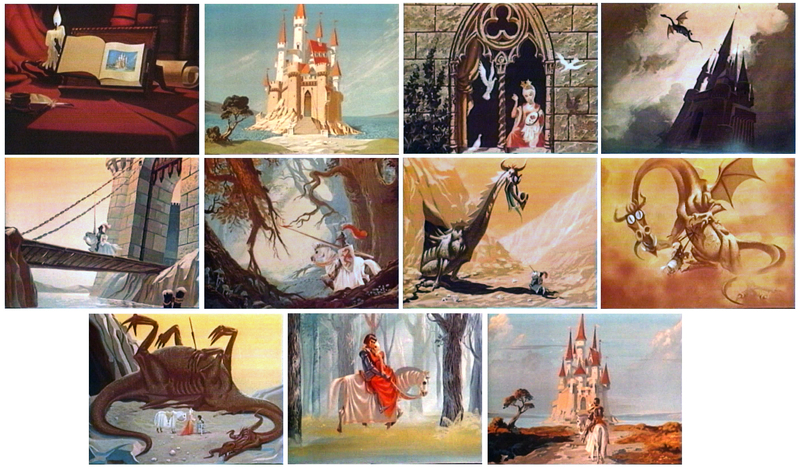 he started after his art studies in 1948 at hungary’s national theatre in budapest as a scenery painter, from 1957 on he worked as animator and created a number of shorts, in 1976 his first directed animation feature film MATTIE THE GOOSEBOY, followed by THE FOX in 1981 and THE CAPTAIN OF THE FOREST in 1987. the FAIRY TALE short starts with some picture book paintings showing heroic knights fighting dragons and saving the princess, then changes into a very different cartoony style to deal with the same content but in a very different way. the short is beautifully animated and full of great gags. I’ve emailed you before about certain painting techniques and your response was so helpful for me! Thankyou. I work as an illustrator of childrens books and sometimes find it challenging to meet deadlines when I don’t feel inspired to paint. What I was wondering is when you work as an artist on a professional level, how do you find inspiration to paint in order to meet deadlines without forcing it? Does that make sense? I absolutely love Dargay’s work, yet it’s rather a shame hardly much of it outside a few films ever made their way to the US, where “VUK” was given prominent exposure on TV (Nickelodeon) and home video. I love his character designs, especially in “Captain of the Forest”.